Hi everyone! Today I'm going to share a new way of using the Interactive Swing Die-namics. You can see the basic ideas for this Die-namics in THIS video where Stephanie creates three interactive swinging cards. First I'd like to share a card I made for today. As you see in the animated GIF above, the dog jumps over a hurdle. I've already shared a similar interactive card HERE, which I made using a simple slider mechanism. By using the Interactive Swing Die-namics, you don't need to cut out a slider channel from your background panel. So your background scene will look more natural and continuous. Let's see how I made this card. The MFT products used are listed at the bottom of this blog post. 1. Prepare the elements in the photo below. Die cut a pendulum out of acetate. Stamp, color, and die cut a dog image. Die cut one more dog piece from white CS. You don't need to stamp a dog on it. Stamp, color, and die cut a hurdle. 2. Create a background panel and a hill panel. Cut a stitched rectangle panel from white CS and stencil clouds with aqua ink. Die cut a hill panel from yellow-green CS. 3. Make a swing mechanism. Attach a Spin & Slide Disc with a strong adhesive (I used 1/8" Scor-Tape.) and put the pendulum piece as shown in the photo above. Adhere the small circle piece on top of the disc. 5. Add the hill panel. Adhere the hill panel with two layers of foam tape. Make sure those foam tapes don't touch the pendulum. I recommend applying some antistatic powder to the side of the stoppers for a smooth movement. 6. Attach the dog to the pendulum. Adhere the hurdle to the hill panel. Attach the "blank" dog piece to the pendulum from the back, then cut off the excess of the pendulum. Adhere the colored dog with foam tape sandwiching the pendulum. Your swinging piece (I mean the dog here.) needs some weight for a quick and smooth movement. That's a reason I add the blank piece and foam tape. Adhere the panel to a card base, add a sentiment panel and embellishments as you desire. I decided to add some banners for a celebratory look. I hope you like my idea and give it a try! I know you prefer seeing this kind of tutorials on videos. But, I'm sorry that I just don't have enough time to edit videos for now. :( Leave a comment below if you have any questions. This is part of this month's MFT Tips & Tricks feature. 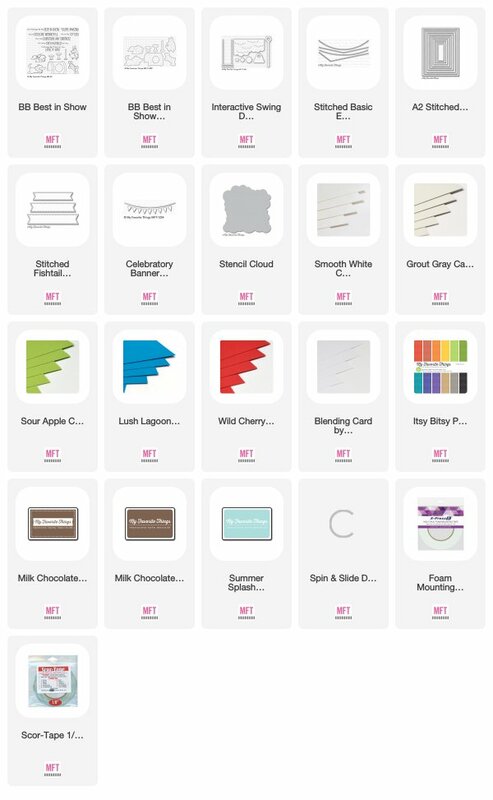 Visit the MFT blog as some of the DT members share fun, clever, and innovative ideas for using the March Release products. Torico, you are the most clever girl! with a clever dog! LOve your way of seeing how this pendulum swings! What a fabulous take on using this pendulum die. Thank you for the detailed pictures. This card is absolutely adorable!! Very clever usage of the pendulum die. WOW! This is so AWESOME! Thank you so much for the tutorial! very cute - thank you for the tips! que c'est joli et vivant, j'adore cette carte en mouvement, c'est très chouette!